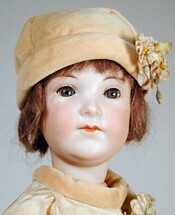 Armand Marseille 39056cm (22") doll circa 1925. Made with a high quality fully jointed composition body, this doll has the multi-stroke eyebrows, sleep eyes, two-toned lips and tiny porcelain teeth of the better quality dolls from the company. The French name Armand Marseille has caused a deal of confusion in the world of antiques for decades. For the dolls marked with this French name were not made in France, but actually made in Sonneberg by one of the largest most successful German doll companies of the 19th Century. The founder of the company, Armand Marseille was born in St. Petersburg, Russia in 1856, where his father was an architect to the court of the Czar. The young Marseille and his five sisters emigrated to the small Franconian principality of Coburg, where their father’s income was sufficient to support them in a stylish lifestyle. Just 20 kilometres to the east lay the town of Sonneberg, where the German toy industry was flourishing. Armand Marseille, by then an eager young businessman of 19-years-old, purchased his first in a series of toy and porcelain factories that he would reconstruct and merge into his own company, Armand Marseille Porzellanfabrik. He had been well educated at the court of St.Petersburg, speaking several languages and developing an astute business mind. He was certainly capable of running a large business and set out to prove it. By 1890 he began producing doll heads and within three years, he employed 550 workers. He and his wife built their family home at Koppelsdorf, a suburb of Sonneberg, and it became the gathering place for their business and personal associates. They raised their only son, Hermann, to follow in his father’s footsteps, which he did, taking over the business in 1918. 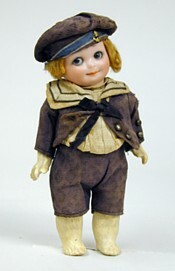 Armand Marseille 353 15cm (6") doll, circa 1925. This little character with exaggerated side-glancing eyes, is called a “googly.” It is seen here in its original factory sailor costume. Dolls heads made by the company were marked with a variation of confusing marks, the only constant element being that they (nearly) always included the initials A.M. The reason for the huge variety of markings is that the doll heads were produced by the Armand Marseille Porzellanfabrik (porcelain comany) for many German puppenfabriks (doll companies) and even for export to American doll companies, who by 1900 had large offices in the German Toy Capital of Sonneberg. In Canada, Armand Marseille dolls were sold at stores such as Eaton’s, where they were marketed as Eaton Beauty dolls. Many a small Canadian girl waited eagerly to see if she would find an Eaton Beauty doll under the tree on Christmas morning. The dolls made for Eaton’s were in no way unique. Unless a doll is in its original chemise carrying the red banner bearing the Eaton Beauty logo, it cannot be said for certain that any AM doll was an Eaton Beauty doll. The standard AM 370 doll head was the first to be used as an Eaton Beauty doll in 1900. It had a bisque shoulderhead and a leather body. By 1905 the AM standard head was from mold #390, a head that was produced from 1900 to about 1938. The AM 390 was made in a wide variety of sizes for dolls from 10cm to 110cm tall. They had glass sleep eyes and an open mouth showing four tiny porcelain teeth. The bodies were of a paper and wood mixture called composition, with lifelike joints at knees, hips, elbows and shoulders. Hundreds of thousands of these heads were produced and used by many companies both in North America and abroad. Over the years, the composition ball-jointed bodies were modified to accommodate the changes in dress styles. 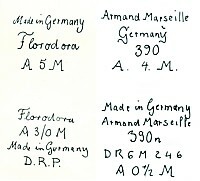 Armand Marseille Porzellanfabrik was known for their consistent bisque quality. The painting of the faces varied, depending on the company that ordered the dolls. Sonneberg doll companies that produced high quantities of inexpensive dolls often used heads that were painted with a single-stroke eyebrow, single-toned mouth, cardboard pate with poor quality mohair wigs, inferior bodies with stick legs or cardboard torsos and very cheesy textiles for the clothing. Suffice to say, they photographed well for the catalog. Because these inferior dolls were the ones most often available in Canada, some Canadian collectors have a tendency to denigrate all dolls marked with the AM mark. This is unfortunate, for the company also produced some of the finest bisque doll heads and some of the most rarely seen character faces. It all was dependent on the doll company that ultimately assembled and marketed the dolls. A 12" AM 400 in all original clothes that sold for $1 at John Wannamaker, Philadelphia in 1928. Some of the names familiar to Canadian doll collectors are of dolls heads made by Armand Marseille for the American Import Company Geo. Borgfeldt, Floradora, Alma, Just Me, NobbiKid, Fany, or for Butler Bros., Baby Betty, Baby Phyllis, for Arranbee Doll & Co, My Dream Baby, Ellar Baby and for Louis Wolf & Co., Queen Louise. When consideration is being given to the purchase of a marked doll, the mark AM has very little meaning in terms of the value of the doll. The factors that must be considered are the quality of the bisque and the painting, the quality and originality of the body, the condition of the doll and the rarity of the mold. An AM 390 with a fine quality fully ball jointed body, in all original factory clothes, original wig, shoes, stockings is still one of the most reasonable buys for beginning collectors. An AM 370 shoulderhead with a leather body, good wig of mohair or human hair, original or appropriate clothes, shoes and stockings should be an even more reasonable buy. The Eaton Beauty chemise and banner add nothing to the value of the doll. Damage to the bisque head or an inferior body will reduce the value by %50 - 60% on the most commonly found AM molds. For many Canadian families, the sentimental value of Grandma’s doll is the most important factor, often far outweighing the actual monetary value of the doll. Having said that, an AM 390 or an AM 370, a Dream Baby or a Queen Louise is certainly worth preserving in the family for future generations. If the doll is in need of restringing, general cleaning, having eyes reset or recostuming, it is important to seek out a reputable doll doctor to do the work for you. Before you send your doll to a doll hospital, ask for references or pictures of the work this person does. 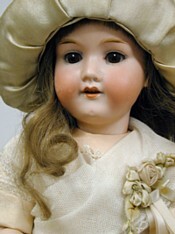 Great harm can be caused to a doll by well-meaning family members or restoration people who do not specialize in dolls. A properly trained doll doctor will perform only the work that is necessary, preserving the integrity of your doll. They will give you a quote prior to starting work and guarantee a time for the work to be completed. You will be expected to place a deposit before work begins and complete payment at the time the doll is returned to you. Various marks found on the back of the heads of dolls made by the Armand Marseille Porzellanfabrik, Germany. In Ontario, the best place to get information about your family doll is at the Toronto Doll Show held annually at the Thornhill Community Centre (see display ad this issue) and the Maple Leaf Doll Club Show held each September in Cambridge. At both shows you will find reputable and experienced dealers and doll doctors who can help you with identity, appraisals and restoration advice. The advantage of the two shows is that you have several experts in one place and they will happily confer with each other according to their specialty. In order to get accurate information, you should either bring your doll along to the show with you or be prepared to make an appointment with the dealer/doll doctor for a later date.